For as long as I’ve been aware, I have always known that, at Christmas time, we hang our stockings on the mantle, kiss under the mistletoe and that a man in a red and white fur suit comes down our chimney and gives us gifts. But why? These traditions come from folklore, some relatively recent and others over 1000 years old. So, in case you are wondering, here are the origins of some of our most popular Christmas traditions. Hanging Christmas Stockings – In the 3rd Century in the city of Myna, which is now part of Turkey, Bishop Nicholas was known as an extremely kind and generous man. He heard about a poor old man who feared he would die before saving enough money for a dowry for his daughters and wanted to help. On Christmas night when the daughters put their stockings on the mantle to dry by the fire, Bishop Nicholas anonymously threw gold coins down the chimney and they landed in the tockings giving the daughter enough money to marry. 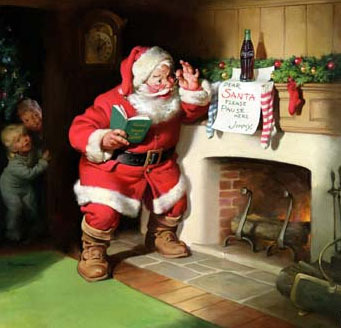 Why Santa comes down the chimney – This may have stemmed form the story of the stockings; with St. Nick tossing coins down the chimney. Thinking logically, the chimney would be the only way for Santa to get inside a home way back when because doors and windows would be locked tight to keep out the cold. But remember, Santa is magical and if you don’t have a chimney, he can get in through something as small as a keyhole. Kissing Under the Mistletoe – Mistletoe is an evergreen with berries. The tradition dates back to an ancient. Norse mythology. The ancient Scandinavians believed that if you encountered a foe while standing under mistletoe (which is a parasitic scrub that grows out of trees) they both had to lay down their arms and promise not harm to one another until the next day. The led to the tradition of kissing through the Norse myth of Baldur. When Baldur was born, his goddess mother made every living and inanimate object in the world promise not to harm Baldur. She forgot about the mistletoe. The god, Loki, was able to kill Baldur using a spear made from mistletoe. The gods eventually brought Baldur back to life and his mother declared mistletoe to be sacred, and from that point on, any two people who pass under the plant must kiss in celebration of the resurrection of her son. 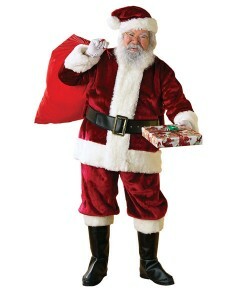 Why Santa Wears a Red Santa Suit – Believe it or not, this is the newest of Christmas traditions. Santa’s look is the creation several artists. Thomas Nast made created the first images of Santa in 1881. He was recreated several times in print, including a cover on the Saturday Evening post by Norman Rockwell in 1920. Santa is perhaps the most commercial figure in advertising. In 1931 The Coca-Cola company wanted to increase its sales of soda in the winter and used Santa Claus (wearing a Santa Suit in their corporate colors, red and white) to create a campaign that not only sold lots of soda but also made the popularity of Santa Claus stronger than ever. Generations later, Christmas would not be Christmas without children all over the world awaiting the arrival of old St. Nick in his distinctive Santa Suit. There are also many bizarre Christmas traditions from around the world but these are the most common. If you celebrate an unusual holiday tradition, tell us about it.